On his first day at the helm of the United Nations, Secretary-General António Guterres pledged to make 2017 a year for peace. 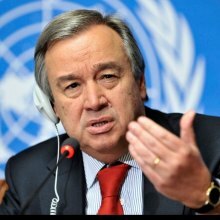 “On this New Year's Day, I ask all of you to join me in making one shared New Year's resolution: Let us resolve to put peace first,” said Mr. Guterres in an appeal for peace, on 1 January 2017. “Peace must be our goal and our guide,” he said, urging all citizens, governments and leaders to strive to overcome differences. Having been formally appointed by the UN General Assembly on 13 October 2016, Mr. Guterres, aged 67, will serve for a five-year period from today to 31 December 2021. He was Prime Minister of Portugal from 1995 to 2002, and the UN High Commissioner for Refugees from June 2005 to December 2015.